This week’s recipe (chicken and dumplings) was something I found on a website I love to visit multiple times a day, Passionate Penny Pincher. I don’t find it as cluttered or time-consuming as some of the other sites I go to and I get what I need quickly. I put this recipe in the Crock Pot in less than five minutes (which was good considering I didn’t give myself any extra time that morning and would have been late to school if it took any longer…oops). Literally, you just dump everything in and go. I had almost everything on hand which was nice because I had already done most of my grocery shopping for the week; all I had to do was buy some chicken. 1. 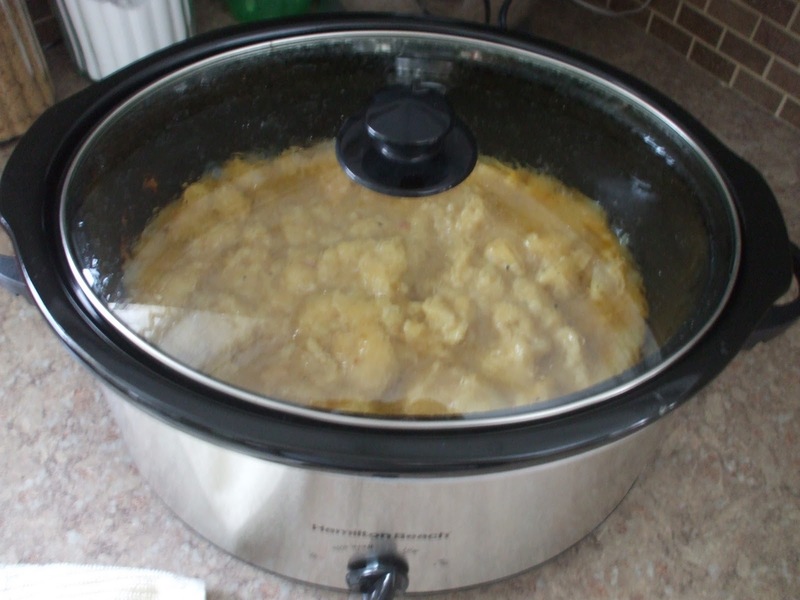 Put chicken, soup, broth, water, salt, garlic powder, pepper, and the onion in the Crock Pot. 2. Cook on low for 6-7 hours. 3. Two hours before suppertime, add quartered biscuits to the pot. Gently stir in biscuits so they are covered. 4. Cook two more hours on low. It doesn’t look really special or appetizing since it’s not colorful or anything, but it was good. When I mentioned earlier in the week I was going to make this, Chris informed me that he wasn’t a big fan of chicken and dumplings. But then he ate two servings for dinner and just had the leftovers for lunch today. I’d hate to see how much he eats of something he actually likes. On the original recipe, the lady said it tasted exactly like the chicken and dumplings from Cracker Barrell, but since I’ve never had those, I don’t know what she’s talking about. But I do know it was good, everyone ate it (Ellie called it her “soup”) and I’ll be making it again.